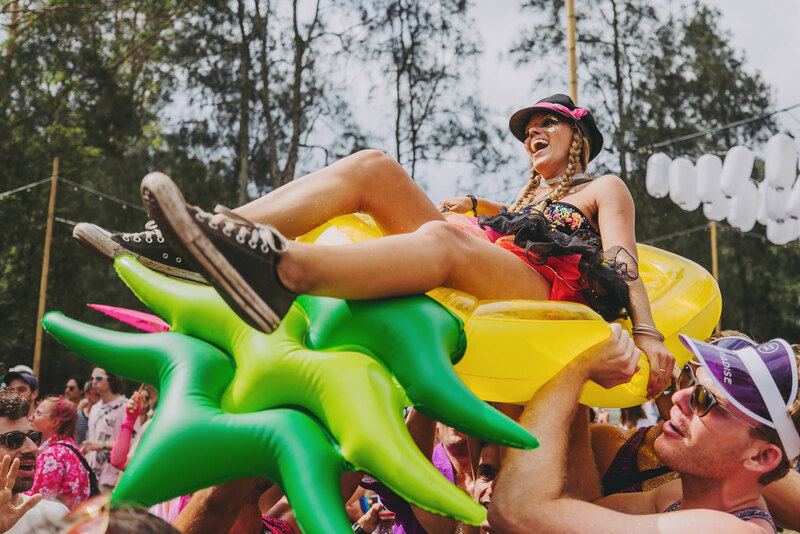 One part boutique festival and one part doof, the epic party that is Lost Paradise returns for its fifth outstanding year with more to experience than ever before. Just an hour’s drive from Sydney, Lost Paradise is set on ancient land known to local Indigenous elders as ‘Paradise Lost’, and is an all-encompassing experience crafted with something in mind for everyone whether they want to party or unwind, from music fans, nature and wellness lovers, foodies, and families. The festival offers a completely immersive escape from city life, a musical playground amongst nature that will inspire, excite and enrich with its kaleidoscope of experiences. This year’s eclectic and thoughtfully curated music offering of outstanding international and local artists raises the bar creating a music playground for attendees to lose themselves in a kaleidoscope of exciting performances across the purpose built uniquely crafted stages within the festival. Lost Disco is set to bring the best of bass, techno and dance music including the irresistible electronic pulse, futuristic synth gurgles and funk-laden basslines of Korean artist Peggy Gou,Belfast’s experimental beat makers Bicep (live) and the hypnotic sounds of Bulgarian native, KiNK (live), Foals (DJ set), Young Franco, Chaos in the CBD, Anna, Yotto, Human Movement, Dom Dolla, CC:Disco!, KLP, Bontan, Krystal Klear, Lex Deluxe and many more are also on the bill. The main stage, Arcadia, will present the edgy rhythms, world melodies and big bold bass lines of cultural icon, activist and game changer M.I.A for a NSW exclusive performance and first in Australia for over five years. The Brit will perform her breakthrough single Paper Planes, recently named #2 track of the century by Rolling Stone magazine. She will be joined by the unbridled talent and off-the-leash creativity of ground-breaking powerhouse Tash Sultana performing her newly released debut album ‘Flow State’; melodic indie and pop of The Kooks with their brand new album, Let’s Go Sunshine; one of the rap world’s most credible and exciting young acts, Joey Bada$$; and disco-centric bangers of Aussie dance trio PNAU – alongside an impressive roll-call of international and local talent including Vera Blue, Ball Park Music, Winston Surfshirt, Furnace and The Fundamentals, Bob Moses and SG Lewis. Paradise Club will have festival-goers dancing into the night, with local acts and surprise guests playing everything from disco to reggaeton, while crowd favourite, My Mum’s Disco returns with its digital jukebox OF 15,000 retro beats, party favourites and guilty pleasures (alongside bingo, karaoke, and an Aussie backyard hangout). Home to the weird and wonderful, Lost Paradise is filled with unique and mesmerising characters and exciting curve balls. Revellers can hitch a ride on impressively built art cars, visit wild theme camps, and be hypnotised by aerial artists and roving performers like the Soul Drumming crew, magical wonders of the Ghetto Shaman, the Stilt Walkers and Motor-Biking Bandits. With an ever-growing desire for a place for festivalgoers to nourish their mind, body and soul, Lost Paradise’s magical Shambhala Fields oasis will showcase some of the most experienced and expert teachers and practitioners from Australia and overseas. Across three full days of talks, workshops and classes, the wisdom keepers will impart their expert knowledge and techniques meditation allowing guests to learn, unwind, and reconnect. The Shambhala Fields program has doubled this year with a dedicated talks and workshops tent presenting a variety of topics from neuroscience, medicinal mushrooms, magic, urban farming, veganism, mental health, sustainability and drug awareness, to African dance, forest bathing and hula hopping; the Shambhala Fields yoga and meditation tent designed by award-winning bamboo architects featuring renowned yogis Mark Whitwell, Eve Gryzbowski, Simon Borg Olivier, Michael De Manicour, Chocolako, and Lara Z; the Healing Arts Space with massage and body work, psychic and tarot readings, reiki and sound and crystal healing; and BOARDI, the Aboriginal and cultural area that aims to recreate an authentic community atmosphere connecting guests to the sacred land and history. Positioned next to Shambhala Fields, the tiniest of guests will have their own entertainment haven at Kids Paradise, with a programme full of fun activities like face-painting, kids disco, bouncing castle, family yoga, circus workshops, comedians, and old-fashioned games. Lost Village is the festival’s shaded foodie hub where guests can dine on one of the long communal tables and fuel their bodies with food and drinks from some of Australia’s tastiest restaurants and food trucks including the much-hyped Instagram sensation Milky Lane, Cold Rock Ice-creamery and renowned festival favourite Holy Cow chai tent. Every taste and preference will be catered for, from home-made dim sum, Japanese and Southern-Indian street-food, authentic wood-fired pizzas, vegan and biodynamic fare, and wholesome treats. Craft beer container bars will serve ice-cold refreshments and revellers can spend time browsing the Lost Bazaar bohemian fashion markets. The Glamping Village, is tucked away in a private corner of Lost Paradise and will offer a range of decadent luxury camping options and full use of exclusive facilities including a welcome reception and concierge service, luxury toilets and showers, a breakfast cafe, cocktail bar, furnished chill-out spaces to meet and mingle, a grooming parlour and a complimentary porter-trolley service. The Eco-Tent Village is convenient and affordable no-frills camping field filled with KarTents (revolutionary temporary festival tents made entirely out of cardboard which can be recycled), Rent-A-Tents and Wow-Tents (quality canvas pre-pitched tents that can be reused). To help combat the alarming statistic that 1 in 4 festival tents are left behind and to reduce non-biodegradable landfill, festivalgoers can pay to arrive to a tent already set-up for them which will then be ethically dismantled when the festival ends. Lost Paradise is committed to their journey towards a fully sustainable event, and see the festival as a vehicle for wider social and environmental change. The Lost Paradise team and artists (totalling thousands of bodies) will be leading by example with a total ban on single-use plastic bottled water back-of-house; the Earth Warriors will be out in force, mounting daily campsite clean-ups and dance-floor patrols using comedy and immersive theatre to encourage people to participate and reduce waste; and DanceWize will be coming to NSW for the first time with their peer education model to reduce drug and alcohol–related harm through providing support, mateship and a chill-out safe space for festival goers.